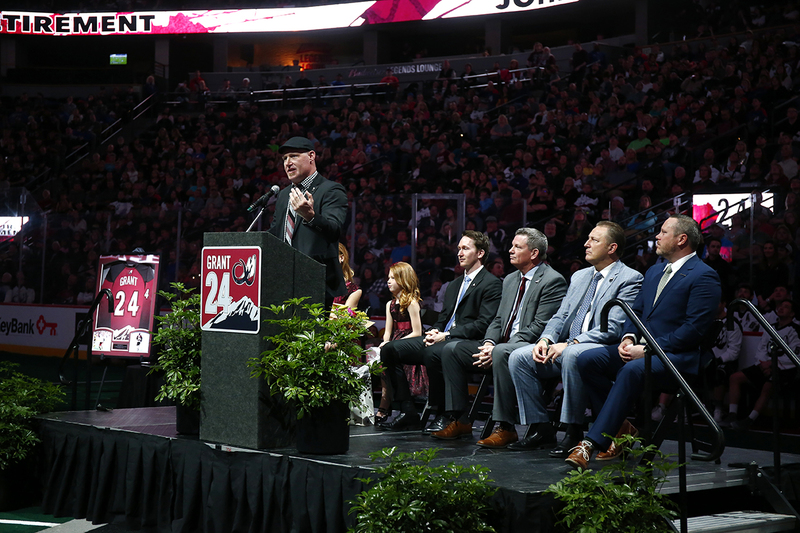 Saturday, the Colorado Mammoth retired lacrosse legend John Grant Jr.’s jersey to the rafters of Pepsi Center. Ceremony speakers included Executive Vice President and Chief Operating Officer of Kroenke Sports & Entertainment Matt Hutchings, as well as Mammoth General Manager Dan Carey. NLL Commissioner Nick Sakiewicz attended Grant’s ceremony and, on behalf of the NLL, presented Grant with a golden stick and a framed photograph. Grant retired in 2017 as one of the best lacrosse players in history, leaving an indelible legacy on the Colorado Mammoth, on the National Lacrosse League (NLL) and on the sport of lacrosse. In seven seasons with the Mammoth, Grant rewrote the record books and stepped away as the team’s all-time leader in goals (235). Grant also retired as second in NLL history in goals (668) and points (1,446). 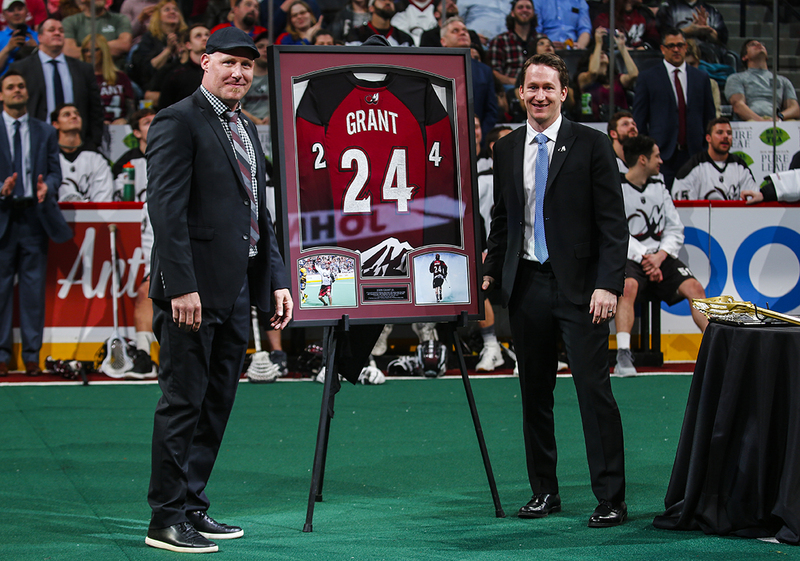 Grant’s jersey is the fourth Mammoth jersey to be retired following Gary Gait’s No. 22, Brian Langtry’s No. 6, and Gavin Prout’s No. 9. Now that Grant has retired from professional lacrosse, his focus is on influencing the next generation of lacrosse players. Grant is Head Coach of the Valor Christian boys lacrosse program. At Pepsi Center on Saturday night, it was plain to see the respect his team has for him as they lined up on the turf to honor their coach. Grant ended his ceremony speech by thanking his family, especially his wife, Raygen, and daughter, Gabby.